Legendary photographer John G. Zimmerman, who introduced ground breaking techniques in sports photojournalism, died on Aug. 3rd, 2002 in Monterey, Calif. He was 74. Zimmerman, who was born in Pacoima, California, attended Fremont High School and participated in the school's three-year photography course, which was considered one of the best vocational programs in the country. Zimmerman, known as one of the true pioneers of sports photography and recognized by everyone as one of the greatest sports photographers of all time got his start in the business after leaving the Navy (where he served during World War II) in the late 1940's. Zimmerman then took odd jobs working for International News and the LIFE Los Angeles bureau. When a job opened up as a LIFE darkroom technician in Washington D.C. Zimmerman headed east. Sports Illustrated was fortunate to claim Zimmerman as one of their early staff photographers. His first cover for the magazine was on August 8, 1955, when his photograph of archery champ Ann Marston graced the cover of Sports Illustrated. 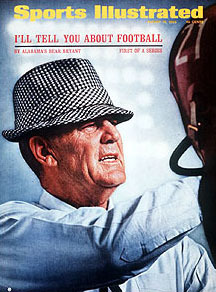 This would be the first of his 107 SI covers spanning five decades. 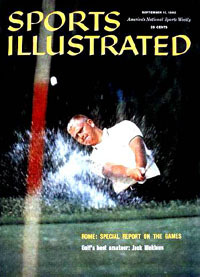 Later Zimmerman cover subjects included: Paul Hornung, Jack Nicklaus, Althea Gibson, Mickey Mantle, Ted Williams, Christie Brinkley and Elle MacPherson. That's right, Zimmerman also worked on five of the famous Sports Illustrated Swimsuit Issues! Zimmerman met his wife Dolores, a flight attendant, on an 83-mile TWA flight from Philadelphia to New York in 1958. Dolores became his business partner so she could spend more time with him and assumed all financial operations when he began freelancing. Zimmerman also worked at Time, LIFE and the Saturday Evening Post. He is survived by his wife, Dolores; three children, Darryl, Greg and Linda; a sister, Molly Bishop, and a brother, Ed Zimmerman. 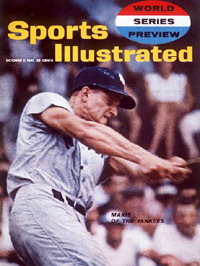 Zimmerman's work was featured in all six "Leading Off" pages in the August 12, 2002 issue of Sports Illustrated. I asked my mother if she wanted to include anything for this article, and she finally suggested that my father never settled comfortably in one job, he was always looking for a challenge. He left Sports Illustrated after only 6 or 7 years to pursue other types of photography with Time/Life Inc. For instance, he did architectural photography and took it as far as he could, then moved on. I reminded her that John had even done TV commercials at the beginning of his career, but she said he chose not to pursue that because it would take even more time away from his family. He finally ended up as a freelance photographer from 1972 to1990. I remember my father telling me that "if you want to like your boss, you should work for yourself." Another of the many things my mother could have mentioned about my father is something that almost everyone who knew him remarks about -- his being a gentleman. He treated everyone with respect, whether they were photo lab technicians at the Time/Life building in New York, young photographers like Neil Leifer or Walter Iooss just starting out, or well-known celebrities. That quality was visible even in my father's years of retirement, as he played countless rounds of golf. He would frequently interrupt his round of golf to walk across the fairway and greet groundskeepers, course marshals or any other of his friends he happened to see. I was told that his nickname on his home course was "the mayor of Spanish Bay." As a child growing up, it was easy for me to see my father as a hero. He met presidents, movie stars and great athletes. He climbed mountains, flew in fighter jets and scuba dived under the ocean. He traveled all over the world and we (my brother, sister and I) would occasionally see him on television at big sporting events like the World Series or the Olympics. As I grew older, I also became aware of the great camaraderie between the photographers of my father's generation. Being around them and listening to their stories was intoxicating, and in order to see more of their magical world, I became my father's photo assistant for a year when I was about 19 years old. Many of the most amazing people I have met in my life, people like Walter & Eva Iooss, Neil Leifer, Heinz Kluetmeier, Vic & Melody Braden, Hollis Brooks & Billy Kidd and many others, I met through my father. They were my father's friends and I have been very lucky in that they have also become my friends. As an adult, I see my father's accomplishments in photography from a unique perspective -- from within his family. I see now what I did not as a child, that my mother was a key to my father's professional success and to the happiness of our family. It was her experience in bookkeeping and finance that allowed him to focus so intensely on his work. She was his advocate, his agent, his partner. It was her ability to give her three children rich, full lives that kept us from noticing that our father was sometimes away from home for 300 days of the year. So if my father was the hero of my childhood, my mother has become the hero of my adult life. My brother, sister and I feel very fortunate to have such parents. I also wanted to say a little about my father's death, since for most people it came as a surprise. I don't know how you found out -- maybe from the tribute in Sports Illustrated magazine -- but for my family, my father's death was not a shock or a tragedy. He lived with cancer (lymphoma) for 13 years, and for most of that time he enjoyed a normal life without major symptoms, which was a blessing both for him and for us. During the last 2 months he had chemotherapy treatments, lost weight and became too tired to play golf and tennis. Yet, even the day before he went into the hospital for the last time he was feeling pretty good. When he finally passed away we were as prepared as we could be and we are happy that he lived such a full life and avoided prolonged suffering. Several of our SportsShooter.com members and friends had some personal experiences with John G. Zimmerman. Their stories are included below. I was only fortunate enough to meet and work with the esteemed Mr. Zimmerman one time in my small career. I remember him humbly asking me to call him John, but to me, he was always Mr. Zimmerman, just as one would respectfully address someone as 'Mr. President' or 'Mr. Chairman'. In my mind, when it comes to sports photography, he is the President. He is the Chairman. As one of the founding fathers of this great profession he had every right to be arrogant and tight-lipped about his many innovative techniques but in fact, he was the complete opposite. He wanted to help young photographers and editors understand how things worked. When SI ran the 6 page spread on him after his death, it was an honor for me to help sort through his collection of work. It made me realize that he shot everything from beautiful portraits to bang-up action and he did it all brilliantly. Quite simply, there will never be another one like him. A number of years ago, a brand-new boss of mine, who was a former POY photographer of the year winner, asked me who my "heroes of photography" were. I jokingly responded, "Helmut Newton, of course." I actually am a fan of Helmut Newton's. But when Brad Mangin gave me the news at PacBell Park during the Bonds 600 home run watch that John Zimmerman had died, I sadly reflected that truly one of my "heroes of photography" had passed. I never had the opportunity to meet John Zimmerman. About as close as I came to him was at one time owning an old original Nikon 300 2.8 of his that is shown on page 14 of the legendary Zimmerman and Kauffman photographing sports book published in 1975. It was just a few months ago that I suggested to Brad Mangin that Sportsshooter should do a story about him with some questions and answers. After hearing of Robert Beck‚s last visit with Zimmerman, I wanted to somehow get to visit him this coming year at Pebble Beach. During my teens, one of the most powerful inspirations for me to get into photography, especially sports photography, was reading the book by Zimmerman and Kauffman. I would read that book over and over, and each time was in awe of the outstanding, innovative, and thoughtful work on those pages. I still have that original book, and many times have thumbed back through it to see what I consider some of the best sports photography ever done. Shortly after I started working in San Francisco I had the chance to meet the late Mark Kauffman. I took a lighting class from him and later had a number of meetings with him to critique my work. What a gentleman and fine educator he was. From everything I've been told, John Zimmerman was very similar. Two very fine men, with excellent taste and a desire to help others. Here's a toast and special remembrance to John Zimmerman. I'm sorry I never got to meet you, but your great work and help and inspiration to others lives on. I had the privilege of meeting John Zimmerman only once, well into my sports photography career, though I was influenced by him long before I ever picked up a camera. In fact, his work was hanging on my bedroom wall in the form of a Sports Illustrated poster when I was only eleven years old. I remember having various sports posters, among them was Zimmerman's basketball glass remote shot of (then) Lew Alcindor shooting his Sky Hook over Nate Thurmond. Later, as a senior in high school, I would be trying my own glass remote with a Minolta SRM. I remember shaking in my boots mounting it up, and I was sure the refs would shut down my little emulation of Mr. Zimmerman, but they didn't and I got one good frame even though it was shot at 1/125th of a second because I didn't know how to push film yet! It was seeing the pictures and reading about the likes of John Zimmerman that gave a spark of hope to a small town kid who didn‚t care all that much for the classroom. A few years ago, having shot a bazillion sporting events and never meeting up with John Zimmerman, I almost tripped over his tripod in the photo well at a S.F. Giants baseball game. I arrived early to the park and was making my way down the steps into the third base photo well when I see that some knuckle head not only had the audacity to bring a tripod to a baseball game, but would then spread the thing out over my favorite shooting position for batters! So I'm thinking something like "Loser" with a capital L, and bending over to read the name on the tripod leg when I read "John G. Zimmerman!" After a double take, my knees got a little weak and I lost most of my verbal skills. I think I tried to tell him how influential he had been to me but I was not very good at it so I ended up just asking him if he was hungry and would like a burrito! He seemed more comfortable with that. With the passing of Mr. Zimmerman, and reflecting on how it is that we navigate through life, I realize that it's the mentors who have gone before us, who have courageously blazed trails because there was no path to follow, who set examples by thinking outside shackles of conformity, who resolutely, in their very way of living, and doing, and creating, implore the question "why not?" help to guide us by example through their own work, even if we never meet them. It is a rare person whose life is like that of a great mountain, the sides of which our own intuitive voices can echo off of and return to us in a new, expanded form. John Zimmerman was one of those rare people. Yes, he was technically brilliant and inventive, with his use of multiple shutters, and slit cameras and such, but to me his mechanical genius seemed subordinate to, and driven by his vision. I think he invented and modified his tools to free that expression of sport that only he could see, or perhaps more accurately, feel. Most sports shooters probably are content if they come away from the game with that one defining 1/1000 of a second, registered cleanly on film from the right viewpoint with some great light. Yes that feels good, like going barefoot and feeling the earth after wearing shoes for years, but Mr. Zimmerman didn't just capture that split second, he deconstructed it, climbed inside of it, made it feel like an eternity, and elevated it so that it was not just beauty recorded on film but a synthesized expression of beauty. He didn't just feel the earth with his bare feet, he spelunked down deep into the cave of that split second, found an immense hidden underground cavern, felt it's damp earth, and heard the drip, drip, drip, in it's stillness. He happened to be editing one of his most famous groups of pictures. It was a series of shots of basketball star Wilt Chamberlain, and it was the first time a photographer had placed a camera above the rim of a basket. Usually photographers don't like someone looking over their shoulder while they edit, but he let me look at them. It was like looking at something from another planet. It had never been done before, no one had seen the game from there. At some point early on in my photo career, while working for Surfer Magazine, I heard about some guy selling a high speed still camera...Some Canon rig that shot 15 frames a second or something. I had never heard of anything so fast in those days. The fastest motor drive was probably five FPS. I got a hold of this guy and said I was interested. How did it work? Was it a Canon product or what? "No," he said, "It wasn't made by Canon." Well, who did make it I asked. "I did," he said. That guy was John G. Zimmerman. I don‚t know everything that John invented or developed or dreamed up in his career but it was a whole lot more than you, me, them or us will even think about in our comparatively puny photo careers. He was a genius. He designed cameras. He designed strobe systems and figured out to use them to help him make better images. He was a hard worker. Heinz Kleutmeier said that they used to think it was arrogant of John to have three assistants on a shoot. Then they realized that John worked so hard that one assistant couldn't keep up with him. Two couldn't either. It was with Heinz that I first really met John. It was a couple of years ago that we hooked up at John's home in Carmel. He was exceptionally charming and the house (on the Spanish Bay course) was gorgeous yet relaxing. His wife, Delores, was equally charming. We all laughed and told stories. Mine were not quite as good as John's and Heinz‚. Delores told her share of good ones as well. We got cheap Mexican take-out and traded more stories. It was a great night. It is hard to explain but it really was a magical night. I listened to the history of photography as I know it. First hand. It was like being a member of royalty. This past year I took Jim Gund and my assistant from Pebble Beach, Kojo Kinno, over to John‚s after one of the rounds. We picked up some cheesy wine and a couple sixers of Beck's Beer. John had said he was excited about having us over. US. The three stooges for all anyone cared. I told him we needn't stay long but I just wanted to say hi and have him meet a couple of the boys. Delores answered the door as warm and gracious as I remembered her. Right behind her was John with a smile wider than Half Moon Bay. He was beaming! "Come on in guys!" he said. They offered us chilled champagne. There were plates of caviar out! Sure, uh, wanna beer John? They got a kick out of that. We told more stories and I egged John on to brag about some of his accomplishments. He told us. But it wasn't bragging. The early days of strobing arenas. Of traveling to far away places with cases and cases of gear. His Sports Illustrated glory days. The Marlboro Man campaign. He finally started to query Kojo about his education and where he wanted to go with his photography. Kojo earnestly told his career plans and asked John what he thought the best way to go about becoming a big photographer was. John said, "I think getting into movies is the way to go...directing and such." Kojo went white and we all went silent. But we listened. We had to. John commanded that attention effortlessly. It was just the way he was. I could have stayed all night and listened to him. To learn anything from someone like him is truly priceless. But the boys were a bit anxious to move on. So we bid farewell. It would be my last to him and I kind of regret that. I really would have liked to spend more time with him. You would have too. Just to see that gleam of life in his eyes. That smile too. He was one of a kind. It all started earlier this year at the Pebble Beach Pro-Am when Robert Beck, who I was assisting, asked me to name my Top 10 sports photographers. I told him a list of names who many would recognize or not. He then asked me if I knew who "John Zimmerman" was. The name was familiar because I remembered Joe McNally talking to students at The Eddie Adams Workshop last year. McNally, who did the 2000 Olympic preview photos for Sports Illustrated with the multiple flash shots, talked about how John Zimmerman did similar kinds of photos long ago without the help of today's technology. Beck then said that Zimmerman lived very close to where we were and asked me if I wanted to meet him. I said, "Yeah....Robert..." not thinking he was going to actually call him. He got the number and the next day Robert Beck, Jim Gund and I were at John Zimmerman's house eating snacks his wife made. Within the couple hours we were at his home, I learned more than I have learned in 3 years in school. He didn't talk about the new digital cameras, or anything like that. He talked about how he never gave away his rights to his photos from back then and how his wife was the reason he was so successful in his career. Watching him say that in a very humble way with a big smile, drinking his wine with his wife next to his side inside his beautiful house with 2 S.I. photographers and one Asian kid, I felt very lucky to be there and to have met "The" John Zimmerman. There are special people, who if you are fortunate can change your life's course. John Zimmerman was one of the kind people who out of his ability and generosity to help others changed the path of my career. 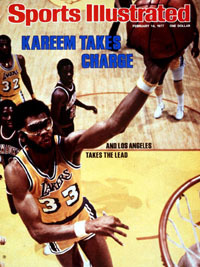 At the time I was 19 years old and a staff photographer for the Los Angeles Times. I would see John regularly around the Los Angeles sports venues and I was always impressed with both his professional and uplifting approach to each assignment. Whether it was an LA Rams game at the Coliseum or a Dodger game, the smile was always there along with his ability to give you a glimpse of how a true master of his craft performed. John had a confidence in himself that was inspiring, and in it's own way it was a disarming charm that made him approachable and allowed one a glimpse at a man who had literally done it all in the business. I truly marveled at how he could always get to the bottom line of a story. Many people looked at him as being a technical genius, but his real forte was his ability to make anyone who he came in contact with feel special about themselves. John was probably the single most influential person at getting me in the door at Sports Illustrated. It was through his friendship with then Sports Illustrated Picture editor and legendary photographer John Dominis, that led to my first meeting with the magazine. He arranged for me to meet John Dominis at his home in Los Angeles one morning while the SI crew was shooting a Dodger World series. It was not so much an interview, but one kind man introducing me to one of his best friend's. Most photographers know how our fraternity is one of close friendships that are interconnected in less then the usual six degrees of separation. John Zimmerman and John Dominis went back to high school days together growing up in Los Angeles How often does one get to say thanks to someone for there unique help in helping you grow. I like to think that what was special about John was that he took the time and helped a young person to move through a door and took great happiness in seeing someone succeed onto a new level. After meeting John Zimmerman and John Dominis, I realized that the pictures were important, but what mattered most was they saw something special in people, and they were unselfish and recognized how important it was to help up and coming young people. My thank you came back to John every time we saw each other and he could see me growing in a very unique position. I always look at the people in my life who have shared a part of themselves in teaching life's lesson's. Be it Jerry Rife, Con Keyes, Lee Romero, Hy Peskin, Rich Clarkson, Walter Iooss, John McDonough, Bill Eppridge, John Dominis or a host of other fine people and friends, I always have a special thank you for a true gentleman, John Zimmerman. I am deeply saddened by the passing of John Zimmerman. In my 26 years in the business, I‚ve gotten to know and work with many fine photographers but only a few stand out in my mind as good guys. Gentleman John was one of those guys. When I first met John, I was scared to death. A big time Sports Illustrated photographer wants to talk to me about fill flash? I remember pulling up to his mansion in Beverly Hills, walking past the tennis court and pool thinking to myself "Big bucks, big ego." That misconception vanished the moment he came to the door, shook my hand and invited me in for a drink. We sat around in his kitchen for a while, talking about flash and then he took me out to his workshop. There he showed me a contraption he had machined to hold (4) Speedlights in a Soft box. The rig was set up so he and an assistant could run along the beach with a model and shoot TTL fill flash at sunset. Another impressive innovation of John's was a split diopter dome port for an underwater camera housing. This allowed him to correct for the refractive index difference between air and water. One of his most memorable shots is of a diver half in and out of the water. A warm smile and a friendly demeanor was John's trademark. Never pretentious, no ego stroking needed. He exuded an aura of quite confidence when he worked and was always pushing the technology envelope to try something new. In 1972, John Durniak got me away from Sports Illustrated to cover the Munich Olympics for Time magazine and for some strange reason, Time could only get one photo credential. Thus, I did it all by myself which was a task before the Israeli massacre. When I got back to New York (with two Time covers in succeeding weeks), I told John I would never cover an Olympics by myself again. It is just too much. Thus, four years later, Time asked me to do the Montreal Olympics and I was able to get two photo credentials along with two tech assistant credentials. John asked me who I wanted to "help." I immediately said John Zimmerman and called him to discus it. Zimmerman said okay and thus, we worked together for an Olympics. I had known and admired him for years, watching how he did things technically that no one had ever tried before -- such as modifying a Hulcher to produce beautiful pictures of runners with colors streaking from behind them as they ran. John did this at the Olympic trials in Eugene, Or. and believe it or not, he put up a black background and lights on a curve and did this very stylized illustration during an actual competition. The pictures were beautiful. We got along wonderfully at Montreal and it was so much fun working with him -- which would be capped each day with a late dinner and great conversation. Needless to say, we did find some of the great French restaurants of Montreal. When it was finished, we did a book of our pictures that was funded by Nikon which made a good remembrance of such a nice and productive time. We shared many assignments for Life, Time and SI in the years before his retirement and all were wonderful and enjoyable times, again with hard work coupled with great after-hours social times. But nothing compares with those three weeks doing the Olympics. John was the ultimate sports photographer. And certainly one of the finest persons I have ever known. "To excel as a photographer requires natural ability, inquisitiveness, charm, persuasiveness. The last element is intensity. The best all-time sports photographers, in my view, are George Silk, John Zimmerman, Walter Iooss Jr., and Neil Leifer."